Coming up in May, I’m going to be taking part in an exciting show called “Denizens of the Forest King” at the Twilight Art Collective, located in West Seattle. It will be Justin Hillgrove, Mike Capp, and myself presenting all manor of monstery beasts! Here’s a bit about the line up! Come glimpse the Forest King’s realm and the creatures and oddities under his stewardship. 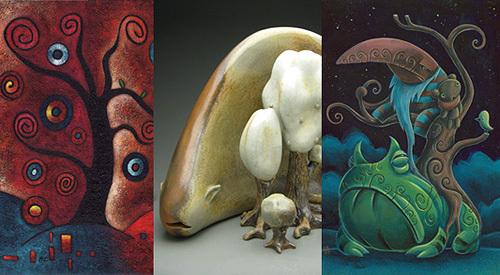 New works by Justin Hillgrove, Eva Funderburgh and Mike Capp. Justin Hillgrove grew up in Snohomish, WA and has been enjoying artistic expression since he was old enough to color on the walls. He studied Design and Illustration at Seattle Central and has since enjoyed many years of freelance illustration and design, working on everything from collectible card games to toys. He paints monsters, imps, robots and other oddities in satirical, sweet or uncomfortable situations he finds amusing, many of which are inspired by his children. Justin has showed at galleries and shows all over the country, with collectors all over the world. Eva Funderburgh is a Seattle artist, who makes strange and slightly whimsical ceramics monsters. While technically a native Seattleite, she has spent most of her life so far in Kansas and Pennsylvania, but is glad to now be back in the land of rain and delicious salmon. A graduate of Carnegie Mellon University, she’s been working on art full time for the past few years, and has created a world of fat, elegant, and clumsy beasts. Her sculptures are finished in a wood fired kiln, an anachronistic process more connected with the Japanese tea ceremony that with the present art world. The end results are beasts that share influences from comic books to Greek myth to Japanese anime, but yet are truly unique. Mike Capp is an accomplished artist who finds inspiration for his artwork through his children’s creativity and pop imagery. His paintings don’t really mean anything dangerous, angsty or irksome. There’s no bubbling social commentary. His paintings which incorporate his young children’s’ drawings aren’t meant to provoke the unarticulated terrors of childhood. They’re just drawings of monsters, superheroes and robots. Even though there’s plenty of angst behind his humor, more so there’s a playful, impish, boy’s mind, full of cartoons and KISS memorabilia. His technique is solid and clean, so he affords himself the privilege of choosing subject material that is loose and silly, while still keeping a close eye on small details of color and composition. He paints what feels good and what results are paintings that are funny and frivolous, in a good way. It’s not as important to understand what his paintings mean, as it is to understand that they are just what they appear to be.